The life of St. Dunstan, one of the greatest English archbishops, was remarkable in many ways. St. Dunstan was not only a clergyman of high rank but also a minister of state and advisor to four English kings. St. Dunstan was born in 909 near Glastonbury to a noble family with royal connections. The studious young man had a special fondness for books and old Saxon songs. He was a gifted painter and silversmith, had a beautiful singing voice, played the organ and harp, and composed music for the glory of God. Young Dunstan, not sure he was ready to become a monk, considered married life. An illness helped him decide: he had developed a serious skin condition that looked like leprosy. After St. Dunstan took monastic vows, he was cured. He lived as a hermit in a tiny cell until 939, when he was appointed Abbot of Glastonbury. As abbot, the saint put great energy into reviving the monastic tradition. Many years of Viking raids had left the monasteries devastated and reduced the number of monks. Due to the efforts of St. Dunstan, English monasticism was restored, and many churches were built and repaired. Glastonbury Abbey became an important seat of learning. St. Dunstan was ordained archbishop. Never afraid to speak the truth, even rebuking kings for their wrong-doings, the archbishop suffered persecution. In the beginning of king Edwy’s reign, the saint was driven out of England, and all his possessions were confiscated. When Edgar the Peaceful became king, he recalled St. Dunstan from exile and appointed him Archbishop of Canterbury. The monastic tradition revived with new vigour. The Synod of Winchester held in 970 established a common rule* for every monastery in England. 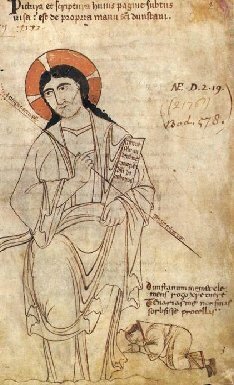 A manuscript illuminated by St. Dunstan is kept in the British Museum. St. Dunstan is also the composer of the hymn Kyrie, Rex Splendens (Lord, the Magnificent King).